SIMPLIFIED CONSTRUCTION - lower initial cost. EXTRA STRENGTH - perfect balance holds maintenance and downtime at an absolute minimum. PERFECTLY BALANCED EXTRA HEAVY STEEL ROTOR - 26" diameter with hammers extended giving the Mighty Samson greater hammer tip speed - actually 270 miles per hour with 3600 RPM direct coupled motor. 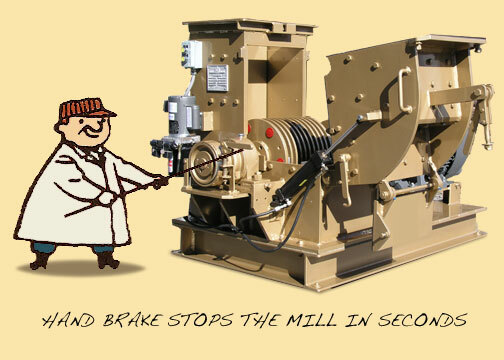 INTERCHANGEABLE SHEAVES AND BELTS - easily get different RPM performance by merely changing the v-belts drive. Fast! Easy! V-BELT DRIVE - reduces floor space ... extra compact installation. FULL BALANCE DESIGN - with the exclusive "Mighty Samson Hammer Mill" steel rotor for vibration-free performance ... cannot fly apart! EXTRA HEAVY THROUGHOUT - heavy duty 2 15/15 FAFNIR ball bearings. Extra heavy boiler plate (3/4") frame ... completedly welded. COMPLETELY FLEXIBLE conveyor feed and discharge design. Discharge to floor, conveyor or straight down to lower level. UNIQUE HAMMER PLACEMENT PATTERN - improves performance and helps to reduce wear. HEAVY DUTY CONSTRUCTION WITH REPLACEABLE WEAR PLATES - Made with a lifetime case fabricated of 3/4" boiler plate with renewable wear plates of 3/4" and 3/8" abrasion - resistant steel. Special alloy steel shaft on FAFNIR ball bearings, complete with oil cup level fittings. FREE-FITTING HAMMER PINS - remove them in seconds, another time-saving feature. ONE-HAND LIFT-TYPE LID - Opens in seconds. No Bolts, No Tools, No Lost Time. Exclusive spring balancing mechanism which cushions the lid and to keep it from opening too far. This feature eliminates all chance of injury to the operator because of accidental lid-dropping. 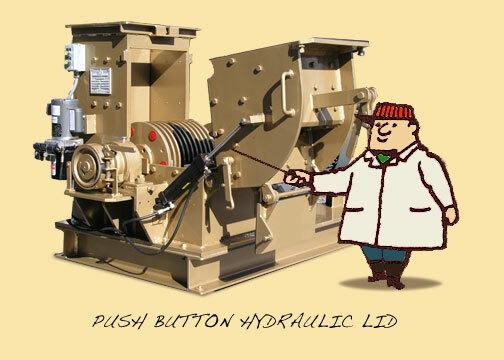 HYDRAULIC LID OPENER - A deluxe feature for extra ease of operation; sturdy, trouble-free operation, a field-tested feature of real importance for many Mighty Samson customers. FLANGED OPENING FOR PERMANENT FEED CHUTE - The feed opening is flanged to permit permanent feed chute - bolted or welded to the chute opening. SELF DUMPING METAL TRAP - protects hammers and screen from tramp metal.